The following report was released by the Nationwide Suspicious Activity Reporting (SAR) Initiative (NSI) Program Management Office (PMO) in August 2013. 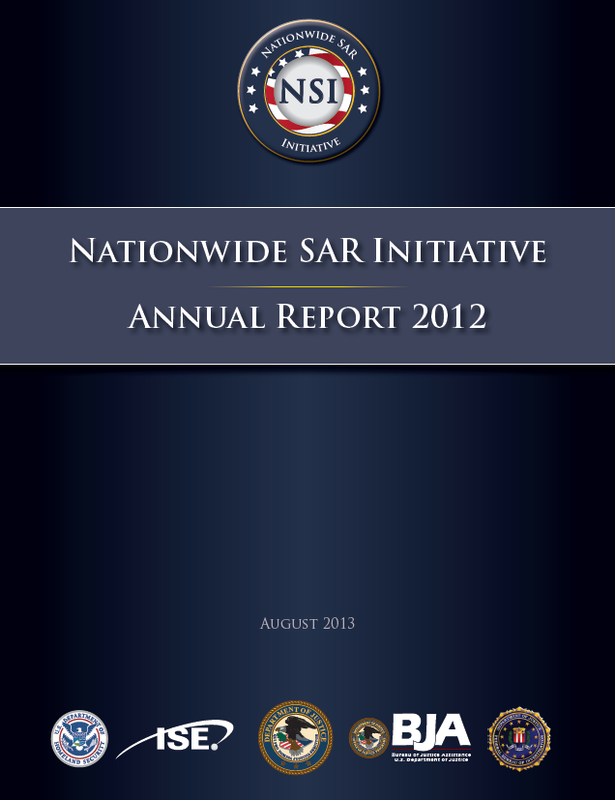 In March 2010, the Nationwide Suspicious Activity Reporting (SAR) Initiative (NSI) Program Management Office (PMO) was established as a collaborative effort led by the U.S. Department of Justice (DOJ), Bureau of Justice Assistance (BJA), in partnership with the U.S. Department of Homeland Security (DHS), the Federal Bureau of Investigation (FBI), and state, local, tribal, and territorial (SLTT) partners. Through its work with the National Network of Fusion Centers, hometown security partners, and SLTT and federal law enforcement, the NSI PMO continues to implement NSI policies, processes, and standards across all levels of government while ensuring that privacy, civil rights, and civil liberties are protected. Over the past year, the NSI PMO has continued its implementation efforts and outreach to NSI stakeholders to help ensure that law enforcement and homeland security partners are afforded another tool to help identify and prevent terrorism and other related criminal activity. The ongoing collaboration among DOJ, DHS, the FBI, SLTT partners, and the National Network of Fusion Centers has strengthened, allowing the NSI to expand its nationwide information sharing capability. As of March 2013, 73 fusion centers have met the requirements outlined by the NSI PMO to be fully NSI-Operational—an increase of 5 centers from the same time last year—and all 78 fusion centers now maintain the capability to contribute and share suspicious activity reports through the Shared Space or eGuardian. This expansion of the NSI has allowed the Federated Search Tool to be accessed by more trained users—increasing the number of searches to more than 76,400—and more than 25,900 Information Sharing Environment (ISE)-SARs had been submitted and shared by the end of March 2013. Further, with the support of the National Network of Fusion Centers, 46 states and the District of Columbia are participating in statewide implementation of the NSI; implementation efforts are currently under way in Guam, Puerto Rico, and the U.S. Virgin Islands to ensure a strengthened nationwide capacity for sharing ISE-SAR information. Since the NSI’s inception, the FBI has been a partner in the furtherance of efforts related to the sharing of terrorism-related information. Over the past year, the NSI PMO has continued to foster this partnership. The NSI PMO has worked closely with the FBI’s eGuardian team to identify, address, and resolve issues with system computability, data synchronization, and alignment of policies. Through this collaboration, a key NSI improvement was realized—the institutionalization of an automatic transfer of information from the Shared Space to eGuardian. In addition to system compatibility enhancements, the NSI made significant technology improvements to the NSI Federated Search in 2012. As a strong proponent of responsiveness to system users, the NSI PMO responded to agency requests and developed capabilities for fusion centers to easily deploy Web-based data entry forms. These Webbased forms allow citizens and law enforcement and first responder personnel to submit SARs directly to their fusion center. As one of the NSI’s federal partners, DHS has continued to support the core mission and efforts of the NSI. In 2012, DHS’s Office of Intelligence and Analysis (I&A) integrated suspicious activity reporting into the interagency “Roll Call Release” (RCR) product line to inform its customers of key issues and emerging trends relevant to homeland security threats. The RCR products, which are produced jointly with the FBI, have proved to be valuable intelligence products through which ISE-SAR information can be shared with various partners. The DHS “If You See Something, Say Something™” public awareness campaign—launched in conjunction with the NSI—has also made major strides over the past year in raising public awareness of indicators related to terrorism and encouraging individuals to report suspicious activity to their local law enforcement authorities. The NSI PMO maintained its emphasis on engaging key stakeholders and partners across the country, through both training efforts and communications, to inform them of critical NSI updates and advances to NSI policies, training initiatives, and technology. In the past year, the NSI PMO has continued its focused outreach to chief executives and frontline officers, resulting in more than 296,000 law enforcement officers and related personnel having completed the SAR Line Officer Training—an increase of 143,465 personnel trained over the past year. The NSI PMO has also advanced its training efforts to public safety partners, otherwise known as “hometown security partners,” resulting in the training of over 72,500 individuals across five key sectors. In addition to community and stakeholder outreach, the NSI PMO has continued its work with the Office of the Program Manager, Information Sharing Environment (PM-ISE); the FBI; the International Association of Chiefs of Police (IACP)—particularly the IACP Homeland Security and Terrorism Committees—and many other key federal, state, and local representatives and law enforcement associations to continue to improve the overall process of reporting and sharing information related to suspicious activity while advancing a unified approach to this information sharing process. • Increasing public awareness of reporting suspicious activity to law enforcement. • Generating suspicious activity reports by law enforcement. • Analysis conducted by fusion centers and FBI Field Intelligence Groups (FIGs). • Investigation by the FBI’s Joint Terrorism Task Forces (JTTFs). In continuing support of this unified approach to information sharing, the NSI PMO has conducted NSI briefings at a number of association and organizational workshops and training events focusing on information sharing, such as the IACP, the International Association of Fire Chiefs, the Association of State Criminal Investigative Agencies, and ASIS International. During these briefings, NSI PMO leadership advanced audience awareness of the NSI, fostered enhanced partnerships with fusion centers, and emphasized the dividends realized through NSI participation. As a result, the NSI has received numerous inquiries from agencies who want to better understand and participate in the Initiative. The NSI has also received valuable feedback from agencies across the country and is utilizing the information provided to further the unified approach of reporting and sharing of information related to suspicious activity. In support of the UMTT’s emphasis on training, the NSI is updating the SAR Line Officer Training curriculum. The updated training will continue to focus on established indicators and how they relate to emerging threats and actual examples of how law enforcement and homeland security partners have assisted in thwarting potential acts of terrorism and criminal offenses. The new training video will provide frontline personnel with a better understanding of their role in the homeland security mission and how their contributions have a direct relationship to keeping their hometowns safe. The NSI PMO is strongly committed to continuing its support of a unified approach to the reporting of suspicious activity and assisting key stakeholders in understanding how the use of technology, training, and outreach can help lead to a safer America.